In 2006 I had the opportunity to go to a geology conference in Mendoza, Argentina on my way back from field work in Patagonia. Part of this conference, called ‘Backbone of the Americas’, was a day trip from Mendoza at the foot of the Andes up to a view of the highest peak in the western hemisphere, Aconcongua. The point of the trip was to check out the fold-thrust belt structure of the Andean Cordillera. 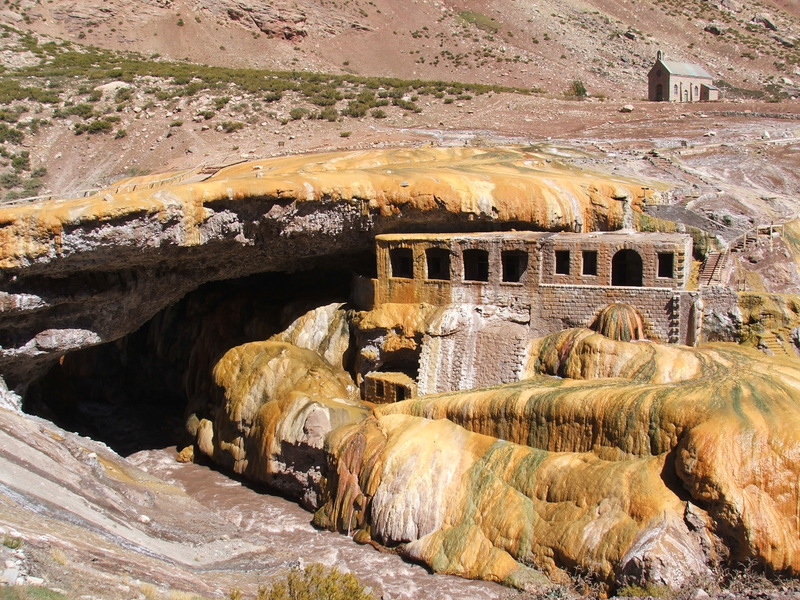 Along the way we stopped at a popular attraction called Puente del Inca. To be perfectly honest, I know essentially nothing about this place … it was a really quick stop (and I haven’t tried Googling it either … yeah, I’m lazy). If anyone knows more about this place – both the natural and human-made structure – please comment below. The orange flow-y looking stuff looks a lot like deposits of some tepid springs here. (Tufa mounds? Travertine deposits, I think?) There’s one place north of Durango where a warm spring has been diverted underneath a highway and into a man-made pile of rocks, and in nine or so years, it has developed layers of travertine (?) that look a lot like your photo. Kim, yeah definitely some kind of travertine deposits … I wonder if that building was something related to hot springs?